Mary Lou Retton during the U.S. Olympic Trials in 1984. The Soviets, in retaliation for the U.S. boycott of the 1980 Olympic Games in Moscow, boycotted the 1984 Olympics. Along with the Soviet Union, 13 other countries boycotted these Games. Despite the boycott, there was a lighthearted and happy feeling at the 1984 Olympic Games (XXIII Olympiad), which were held between July 28 and August 12, 1984. The 1984 Olympic Games saw China participate, which was the first time since 1952. Rather than build everything from scratch, Los Angeles used many of its existing buildings to hold the 1984 Olympics. Initially criticized for this decision, it ultimately became a model for future Games. After the serious economic problems caused by the 1976 Olympics in Montreal, the 1984 Olympic Games saw, for the first time ever, corporate sponsors for the Games. In this first year, the Games had 43 companies who were licensed to sell "official" Olympic products. Allowing corporate sponsors caused the 1984 Olympic Games to be the first Games to turn a profit ($225 million) since 1932. During the Opening Ceremonies, a man named Bill Suitor wore a yellow jumpsuit, white helmet, and a Bell Aerosystems jetpack and flew through the air, landing safely on the field. It was an Opening Ceremony to remember. The U.S. became enthralled with the short (4' 9"), exuberant Mary Lou Retton in her attempt to win gold in gymnastics, a sport that had long been dominated by the Soviet Union. 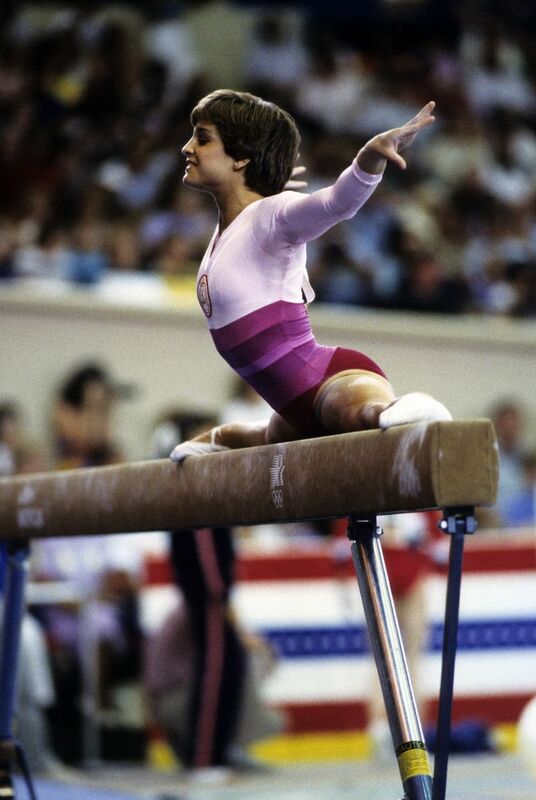 When Retton received perfect scores in her final two events, she became the first American woman to win an individual gold medal in gymnastics. John Williams, the famous composer for Star Wars and Jaws, also wrote a theme song for the Olympics. Williams conducted his now famous "Olympic Fanfare and Theme" himself the first time it was played — at the 1984 Olympic Opening Ceremonies. At the 1936 Olympics, U.S. track star Jesse Owens won four gold medals — the 100-meter dash, the 200-meter, the long jump, and the 400-meter relay. Nearly five decades later, U.S. athlete Carl Lewis also won four gold medals, in the very same events as Jesse Owens. The 1984 Olympics saw the first time that women were allowed to run in a marathon. During the race, Gabriela Anderson-Schiess from Switzerland missed the last water stop and in the heat of Los Angeles began to suffer from dehydration and heat exhaustion. Determined to finish the race, Anderson staggered the last 400 meters to the finish line, looking like she wasn't going to make it. With a serious determination, she made it, finishing 37th out of 44 runners. Olympic Running: Did Zola Budd Trip Mary Decker in 1984?